Saint Mark's Church, at Ford. 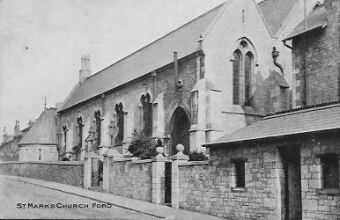 The Anglican Church of Saint Mark the Evangelist was situated on the south side of Cambridge Road, at Ford, Devonport. It has now been demolished. The Ford area of the parish of Stoke Damerel started to grow in the 1850s, following the erection of the Workhouse. It was a long walk to the parish church and so they started to hold a weekly service in a temporary building. At long last, in 1873, the residents bought a piece of land from a Mr Sanders of Liskeard for the price of £526 in order to erect a church. The foundation stone was laid by the Right Reverend Frederick, Lord Bishop of Exeter on Saturday January 3rd 1874, assisted by the Rector, the Reverend W J Saint Aubyn, and the churchwardens, Mr G H H Rundle and Mr James Joll. On December 26th 1879 the Bishop of Exeter consecrated the nave and transepts as a chapel-of-ease to Stoke Damerel. The remainder of the Church was not finished until 1882. It was designed by Mr Alfred Norman, of Buckland Terrace, Plymouth, and was built at a cost of £5,000. The contractor quoted at the time of the laying of the foundation stone was a Mr Walter Lethbridge of Plymouth, but at the time of the consecration it was said to have been built by Mr Jenkins of Marlborough Street, Devonport. The ecclesiastical parish was formed on December 15th 1885 from the civil parish of Stoke Damerel. Built in the Early Pointed style of architecture, the building was of dressed Plymouth limestone with windows, doors and coping of Portland stone. It consisted of a chancel, an 87 foot long nave and north and south aisles. There was a 100 foot tower at the north-west angle. Inside the Church was a half-life-size wooden statue of Robert Falcon Scott, carved by Mr David Weeks and unveiled in 1956 by his Scott's son, Peter (later Sir Peter). Soon there were 300 children attending the Sunday School but the lack of dedicated accommodation for such a School soon became apparent as it was not considered advisable to use the sacred Church for such a purpose. Mr A B Bone purchased from a Mr Saunders a piece of land adjacent to the Church upon which to erect an iron building to be adapted for the purpose of a Sunday school. At 3.30pm on Saturday March 12th 1887 the congregation and children from the Sunday School gathered for the laying of the foundation stone. After a short service in the Church, led by the vicar, the Reverend H L G Coomb, they then went outside to witness Mr Bone declare the stone well and truly laid. Among those also present were the churchwardens, Mr Jenkins and Mr Milton; the superintendent of the Sunday school, Mr Rogers; and Mr Foster Bone; Miss Bone; and Mr W Littleton, of Morice Town, Devonport, who carried out the masonry work. The school building was erected by Messrs Lysaght, of Bristol. It cost some £450 and measured 70 feet by 25 feet. It was to be fitted with reversible seats. On the afternoon of Saturday August 20th 1887 Mrs H J G Coombes, wife of the incumbent, laid the foundation stone of the new vicarage. It was designed in the Domesticated Gothic style by Mr Charles King of Princess Square, Plymouth, and built by Messrs G H Smith & Son of Stoke. Mr S A Roach of Union Street, Plymouth, was entrusted with the dressed stone work and prepared the engraved foundation stone. The Vicarage was constructed using local stone, faced with dark blue Pomphlet limestone and dressed with Hamhill stone. Beyond the entrance hall and lobby were the drawing-room, dining-room, study and seven bedrooms. It was built at a cost of £1,678. Among those present at the ceremony were Mr Charles King and Mr J H Rundle, architects; the Reverend W Saint Aubyn, Rector of Stoke Damerel Church; the Reverend & Mrs HL G Coombes; Mr Jenkins and Mr Milton, the churchwardens; and Mr W Pitcher, the organist and choirmaster. It is interesting to note that during the speeches it was revealed that the incumbent 'was without a single penny of certain income' due to the lack of any endowment for the Church but it was hoped that the provision of a brand new vicarage might go some way to making up for that. However, it was hoped soon to be able to offer him a stipend of £200 per year. This certainly encouraged vicars to visit their flock more often, in the hope of receiving at least a cup of tea and a slice of cake. A permanent Sunday School was erected in 1909. The church was damaged by enemy action during the Plymouth Blitz of 1941 but was rebuilt. On November 23rd 1952 a memorial to the chapel-of-ease, the Church of Saint Clement in Warleigh Avenue, Keyham Barton, and to those of the Parish who had lost their lives during the Second World War, was dedicated at Saint Mark's Church. Known as the Saint Clement Light, it was designed and erected by Messrs Osborne and Phillips of Plymouth. It cost nearly £200. The ceremony was carried out by the Rural Dean, Canon W L B Caley, supported by the Lord Mayor and Lady Mayoress, Alderman and Mrs H E Wright. The service was conducted by the Vicar, the Reverend T Derwent Davies and a congregation of over 700 attended. Representatives of the Services were in attendance and when their flags were lowered, Bugler K Packwood of the Royal Naval Barracks sounded the "Last Post". After the service the Lord Mayor took the salute at a parade led by Mr George Moss and the band of the Girls' Nautical Training Corps. They were followed by the Plymouth Old Contemptibles' Association, the Plymouth Britannia British Legion and its women's' section, the 14th Devonport Boy Scouts, the 4th Devonport (Saint Mark's) Boy Scouts, the Saint Mark's Girl Guides, Brownies and Cubs and the Saint Anne's Girl Guides and Brownies. This was the second of three Lights to be installed at the Church. The Saint Mark's Light was dedicated by the Bishop of Plymouth in 1951 and the Saint George's Light would be dedicated in 1953. Saint Mark's Church has now gone the way of many of the smaller places of worship in Plymouth and the final Eucharist took place on Palm Sunday, March 20th 2005. The following month it was emptied of furniture. I am grateful to Mr Paul Webber of Saint Mark's Church for the news that the demolition contractors finally moved in at the end of January 2007. The congregation have moved temporarily to the Church of Saint Bartholomew at Milehouse and the Saint Mark's site will be redeveloped with a smaller Church and residential units. The splendid Vicarage remains intact.